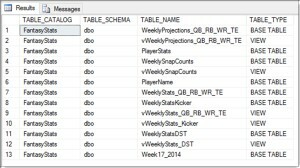 There are many instances where I like to get details about tables, views and the fields contained within a given database. 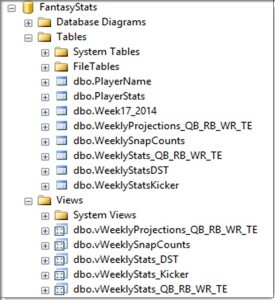 A simple way to get at this information is querying a database’s INFORMATION_SCHEMA views. The following post will give a couple examples of how to work with these valuable objects. 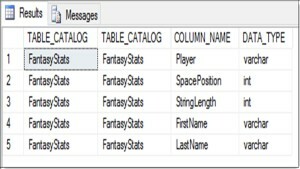 From MSDN: An information schema view is one of several methods SQL Server provides for obtaining metadata. 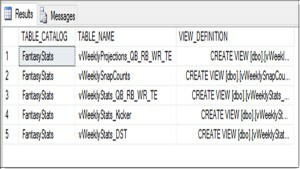 Information schema views provide an internal, system table-independent view of the SQL Server metadata. Information schema views enable applications to work correctly although significant changes have been made to the underlying system tables. The information schema views included in SQL Server comply with the ISO standard definition for the INFORMATION_SCHEMA. 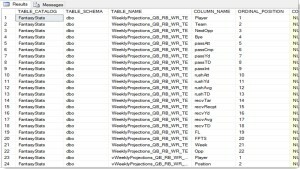 As you can see, the INFORMATION_SCHEMA views contain a lot of valuable metadata about tables and views in each database. I find these to be very handy when I need to evaluate or use this information in analysis and research purposes. If you would like to post any additional examples, please add them to the comments below.